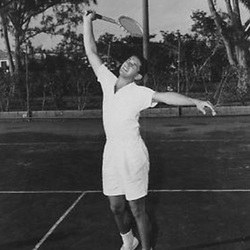 Many years before the Hurricanes football team went undefeated and wreaked havoc thoughout the country, the Hurricane netters dominated the national tennis scene like no other, and Sidney Schwartz was one of the major players. The Brooklyn native came to Miami as one of the country's top junior players, having been featured in a photo spread in LIFE magazine in 1945, and helped the Canes begin a decade long dynasty. At age 16, he upset fomer UM great Gardnar Malloy in the U.S Men's Indoor Championships, before falling in the quaterfinals, and brought that game to Coral Gables, after winning both the 1947 and 1948 National Junior Indoor titles. In 1948, Schwartz was runner-up in the U.S. National Indoor Championships. In 1949, Sid won the UM Invitational Championships by beating Davis Cup player Malloy once again. The Canes netters won 23 straight matches that year. In 1950, the team finished 18-0 and ended 2 time National Champion William & Mary's 83 match victory streak and during that summer, Sid reached the quarterfinals of the U.S. Nationals, now known as the U.S. Open, at Forest Hills, N.Y. In 1951, Sid helped lead the Canes to the #1 ranking in the country, while being ranked 15th in singles. Unfortunately, the school chose not to compete in the National Intercollegiate Championships each of his 4 years, or Schwartz and his mates could have won several team championships. During those 4 years , the UM squad never lost a regular season match. After UM, he won the 1953 U.S. Army Single Championships held at West Point and the 1953 Blue/Grey National Tennis Classic Doubles with Don Kaiser in Montgomery, Alabama. Schwartz played the amateur circuits for many years, including winning the USTA Senior Doubles titles in 1968 and 1969 with former UM teamate Tony Vincent. He was elected to the U.S.T.A. Eastern Tennis Hall of Fame in 2009. At UM he graduated with a bachelor in Business Administration. He was tapped into the Iron Arrow Society, the highest honor attainable at the university, and was a member of the M Club. He is retired and lives with his wife, Naomi, in Boynton Beach, FL.